Poor Samsung launched their latest punt at digital music success just as Spotify was stealing all the media oxygen with its acquisition of the Echo Nest. Samsung’s latest venture, curiously called ‘Milk Music’, is another attempt from the smartphone giant to carve out some mindshare and consumer traction in the digital music space. Like all but one smartphone manufacturer – you know, that one from Cupertino – Samsung does not have the best of track records when it comes to digital music, having recently culled its previous Hub service. Milk is a Pandora-like mobile radio app and while it certainly suffers from ‘me-too syndrome’ it is not actually a terrible strategic fit. With 200 stations and a catalogue of 13 million tracks, Milk Music has some muscle but it is hard not to see it as a thinly veiled attempt to ‘do an iTunes Radio’. However there is not necessarily that much wrong in doing exactly that. iTunes Radio is a very neat service that is well geared towards the mainstream, less engaged music fan. That is exactly Samsung’s addressable audience. Samsung has been at the vanguard of the mainstreaming of smartphone adoption, so much so that many of its devices are smartphones with dumb users. Milk Music is however limited to the Galaxy range of handsets, which will to some degree filter its audience towards Samsung’s more engaged users. No smartphone manufacturer has been able to make music work like Apple has. In fact no smartphone manufacturer has been able to make content and services as a whole work like Apple has. Apple’s ecosystem is a fascist state compared to Android’s federated democracy, but at least the trains ran on time in Mussolini’s Italy. 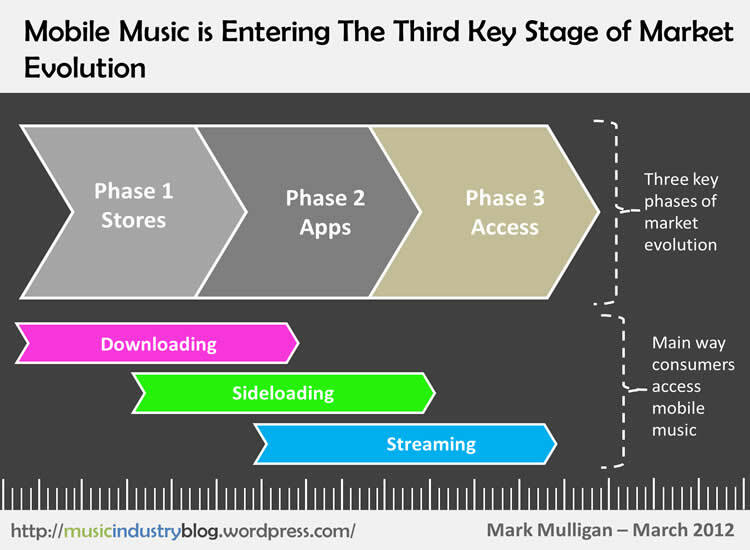 That absolute control of the user experience enables Apple to deliver on the single most important part of digital music product strategy: the service-to-device journey. It just happens, and seamlessly so. So many other phone companies have failed to understand the importance of this ineffable magic. Samsung might be able to get it right with Milk Music, but because they are part of the federated states of Android, they will also have to tolerate a bunch of pre-installed incursions from fellow Android states, not least Google’s Play Store. Apple meanwhile ensures there is just one place for music on its devices. Subscriptions are still only a small share of the music market but their time is coming. That time is long over due (I and my former Jupiter colleagues David Card and Aram Sinnreich first started making the case for subscriptions back in 2000) and a slew of big players are getting ready to play ball now that subscription look ready for primetime. But they will find it far from plain sailing. Spotify, Deezer, Rhapsody, Muve, Rdio, WiMP etc. have done much get the market moving and although there are still major challenges ahead (e.g. 9.99 not being a mass market price point) a host of new entrants are poised to make their moves. The much mooted / touted (delete as appropriate) Daisy is one of the more eagerly anticipated ones (see my take here) but focus has recently turned to potential moves from big players like Amazon and Google, while Apple’s arrival in the subscription market is becoming Godot-esque. Apple: Apple was the music industry’s digital beachhead but now Apple has a problem. Downloads were a transition strategy with one foot in the digital future and one foot in the analogue past. Apple has built a paid content customer base founded on ownership, a la carte transactions and downloads. Meanwhile it tiers its hardware pricing by hard-drive capacity. In some ways this latter point matters most: in the streaming era consumers download less which means there is less need for higher capacity devices, which in turn means that demand for the higher priced, higher capacity devices tails off. Apple can use subscriptions to address this issue by creating bundles e.g. iPad Gold, a $200 price premium with device-lifetime access to an iTunes music, video and Apps subscription. This sort of tactic will be crucial for Apple because the concept of digital content subscriptions is alien to the vast majority of its 400 million iTunes customers. If anyone can make subscriptions work, it is Apple – and I believe they will – but currently its customer base, hardware pricing and content offerings (iMatch and movie rentals excepted) are simply not the right foundations for building a subscription service on. A lot needs to change before Apple and its customers are ready for subscriptions. Amazon: Amazon’s content-device strategy is the mirror opposite of Apple’s: Amazon is selling devices to help sell content. Amazon needs to be a key player in the music and video business because these low price point items are the bottom rung on the purchase ladder that Amazon hooks new customers in with. Subscriptions though, are high consideration items. Amazon is hoping it can nudge customers up to monthly subscriptions in the same way it can nudge customers from a CD to a laptop. But it isn’t the same transition. Most Amazon customers have a lot of one-night stands with the retailer rather than a relationship: it is where they go to get stuff, not to immerse themselves in experiences. Of course Amazon is trying to change that – particularly with video – but it requires a fundamental change in the relationship with its customers. As with Apple, a device / subscription bundle strategy will deliver best near-term results. Google: Google has the most diverse set of assets at its disposal. In YouTube it has the most successful streaming music service on the planet and in Google Play it has, well, not the most successful digital content store on the planet. Launching a subscription service on YouTube is an obvious option and the sheer scale of YouTube means that even with highly modest conversion rate it can easily become a major player very quickly. But the fact that YouTube is free is core to why it is so popular, so the vast majority of its users have little interest in paying fees. Thus Google will have to ‘think different’ to make subscriptions work on YouTube. But where Google could really make the subscription play work is, well, on Play. Not Play by itself though but instead as a tightly integrated subscription – device ecosystem with Motorola. A while ago I wrote that Google ‘needs to do an Apple with Motorola’. It still does, but it should do so in a manner fit for the cloud era by hard bundling a Play subscription service into Motorola handsets. (You should be spotting the theme by now). Samsung / HTC / Nokia et al. By this stage any readers from a non-Apple and non-Motorola handset business might be beginning to wonder how on earth their companies are going able to squeeze themselves into the subscription equation. It is a very good question. 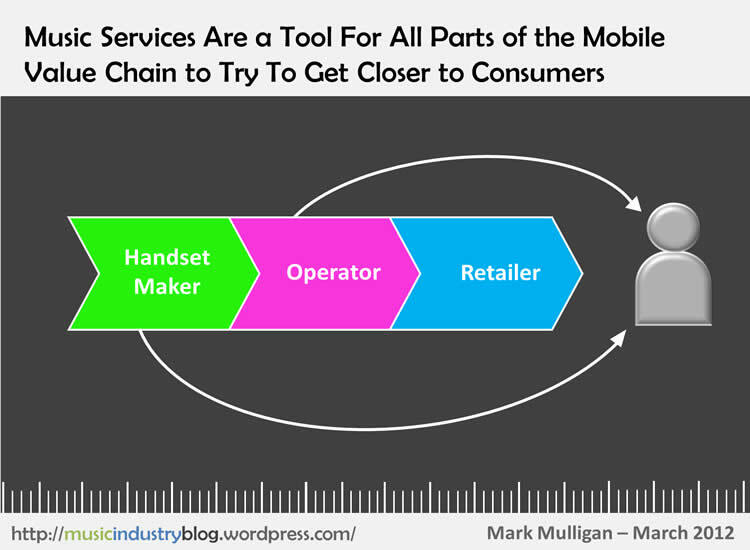 Most mobile handset companies are at a crucial juncture, they now face the same problem as ISPs did in the mid-2000’s: unless something changes mobile handset companies are going to become ‘dumb devices’ just as ISPs ‘became dumb pipes’. Nokia recognized this earlier than most but got the solution wrong – or at least the implementation – with Ovi and is slowly clawing its way back. But all of them have a huge task ahead them if they are to avoid becoming helpless observers as other companies build robust digital businesses on the back of their hardware. If they can harness the carrier billing relationship then they have a truly unique asset for building a music subscription market, but that is much, much easier said then done (remember Comes With Music?). All of these business have the potential to be successful subscription businesses but none of them will find it an easy transition and none of them are guaranteed success. Not only will they have to transform their products, pricing and customer bases, but they will also have to develop entirely new business practices. To some degree or another, all of these companies have to make the transition from being retail businesses to being subscription businesses. Being in the subscription business is all about managing churn. It doesn’t matter how good a job you do of acquiring customers if you can’t keep hold of them. These are the skillsets that Rhapsody has been quietly perfecting for years and that Spotify is quickly learning. A successful subscription business can appear like a duck, slow moving above the water line, but feet moving furiously fast below. Any business that is new to subscriptions – whatever they may say to the contrary and whatever talent they might hire in – is going to be learning the ropes. Which is another reason why hard-bundling subscriptions with hardware makes so much sense for these new entrants. Besides the consumer benefits of turning an ethereal subscription into a tangible product, they allow the providers to plan for 12 to 24 months worth of customer life time value rather than worrying about subscribers churning out after just a month or two. Even though downloads and CDs will still dominate global music revenues by the end of 2013, it is going to be a big year for subscriptions. Whether the new entrants can help turn that into a big decade remains to be seen. I spent this morning listening to Omnifone’s CEO Jeff Hughes and CFO Matthew Bagley rounding up what has been a good year for the white label music service provider. Omnifone have been in the game for a lot of years and have seen their fair share of ups and downs. Now 10 years on from being founded they have turned their first annual operating profit, from a record full year revenue of £29.5 million. When Omnifone first came to market it had no shortage of direct competitors. But as the first wave of digital music services, powered by Omnifone competitors such as OD2 and MusicNet, smashed against the rocks of the new upstart iTunes Music Store, the marketplace soon consolidated. Omnifone wasn’t quite the last man standing, but it certainly had a lot more competitive leg room. Over the intervening years it has managed to establish a solid reputation for providing the back end infrastructure for music services for global brands such as Sony, Blackberry and Vodafone. Over the last year or two though, Omifone has been quietly repositioning around the streaming zeitgeist. The most visible ouput of this strategy to date has been the formation of the direct to consumer streaming service Rara, which has since been spun out of the company. Hughes says of streaming music that Omnifone has “built a racetrack and now we want to put horses on it”. This, he adds, will not just mean working with big global companies but also starting to work with a select number of ‘interesting’ start-ups, up to 5 a year. Hughes points to bullish streaming and cloud music revenue forecasts by the likes of Strategy Analytics and ABI Research as an indicator of the market opportunity. Although these forecasts are optimistic (to put it mildly) there is clearly a pronounced pivoting towards streaming consumption. As regular readers will know, I have little faith in 9.99 ever being established a mass market consumer price point and it will certainly never drive the numbers some people are forecasting. But work with a hardware company to absorb some or all of the cost of the music into a device or car (or even a home as Hughes suggested) then you start to have the ability to drive mass market adoption. Four years ago I proposed the creation of digital music box for the living room, to halt the steady demise of the home hi-fi. Back then the economics of the proposition had to be engineered around pre-installed downloads, making it nigh on impossible to make the concept work at mass market price points without dramatic license rate discounting. Streaming changes all of that. Now the concept of a $/€/£250 hi-fi unit with a year’s worth of fully integrated unlimited music is a genuine opportunity (and one that some one should address with urgency). Omnifone is exactly the sort of company who could make it happen with the right device brand. Of course Omnifone no longer has as much competitive leg room as it once did, with the likes of 24/7, 7 Digital and Aspiro all contributing to an increasing competitive marketplace. But as streaming continues to help drag digital music out of doldrums, Omnifone could yet play a key role in the future of digital music. Though the ISP bundle opportunity appears to be diminishing with every month that passes, mobile carriers (e.g. Cricket Wireless) and handset manufacturers (e.g. HTC) are showing growing enthusiasm for bundled music strategy. Once the dust settles on Spotify’s stellar year, and it is clear just how much all the other streaming service ‘boats’ have been risen by Spotify’s ‘high tide’, I expect we’ll see an even stronger case for the bundled music service, and in turn more demand for the services of Omnifone et al. Yesterday I delivered a keynote at the Music 4.5 Mobile music conference. My presentation was entitled ‘Mobile Music: Apps, Ecosystems and the Cloud’ and here are some of the highlights. I’ve been a music industry analyst for more years than I care to remember and I recall my first mobile music experience being on a Wap 1.0 handset with a monochrome screen and no graphics. Mobile music has obviously come on a long way since then but it remains hindered by the recurring error of trying to do too much too soon. Mobile seems to be perennially burdened with developers’ aspirations being one step ahead of what contemporary mobile technology can deliver. Witness the continually delayed arrival of ‘NFC payments are about to go mainstream’ as a case in point. Mobile music’s poster child Shazam, was itself far too early to market. I remember being demoed the tech by the founder a decade ago. It took the advent, many years later, of the iPhone and the iTunes App Store to enable Shazam to become the runaway success it currently is. Most start ups aren’t lucky enough to manage to wait for the pieces to fall in place. Mobile music is undoubtedly going through an unprecedented period of buoyancy, perhaps even prosperity, driven by two key dynamics: the rise of smartphones and the app boom. 46% of UK consumers have a smartphone (see figure 1) which at first glance presents a great addressable audience. But as my former colleague Ian Fogg observed, as smartphones go mainstream we end up with the quasi-paradoxical situation of smartphones with dumb users. (By way of illustration one panellist referred to a customer request supporting for his HTC iPhone). Most new smartphone users don’t even use a fraction of the functionality on their devices and this creates big problems for music strategy. 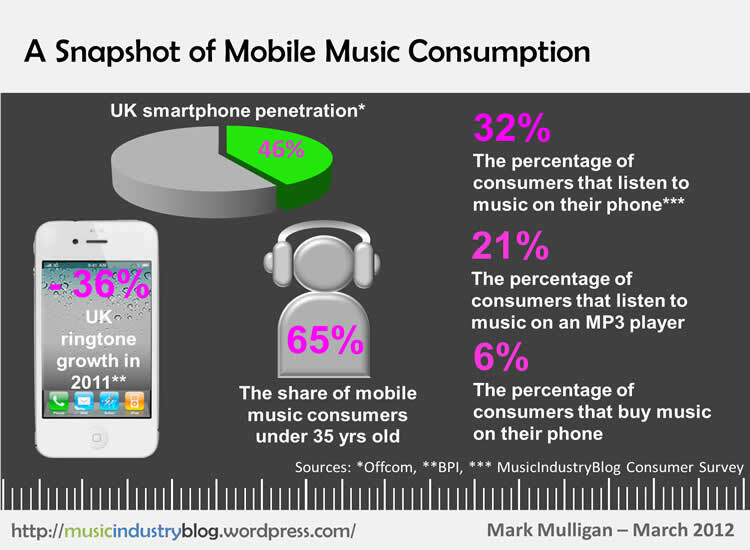 Because mobile music apps are inherently the domain of the tech savvy, not the tech-daunted majority. It is easy to think that the future of mobile is apps. But as a cautionary tale consider that UK ring tone revenues plummeted by 32% in 2011. Once ring tones looked like the future of mobile music. Things change, and quickly so. Mobile Music has had more than its fair share of false dawns, largely because of wrongly set expectations. The App revolution appears to have finally kicked mobile music into market maturity, though in actual fact it is just one more step on the journey. One of the key reasons apps have been such a runaway success (Apple just announced its 25th billion App download) is because they play to the unique characteristics and strengths of mobile as a channel. They deliver fun and convenient experiences that are typically also social, location sensitive and instantaneous. All integral parts of the mobile phone’s DNA. All of which is great of course, but there is a risk that the current infatuation with Apps is a focus on form over function. 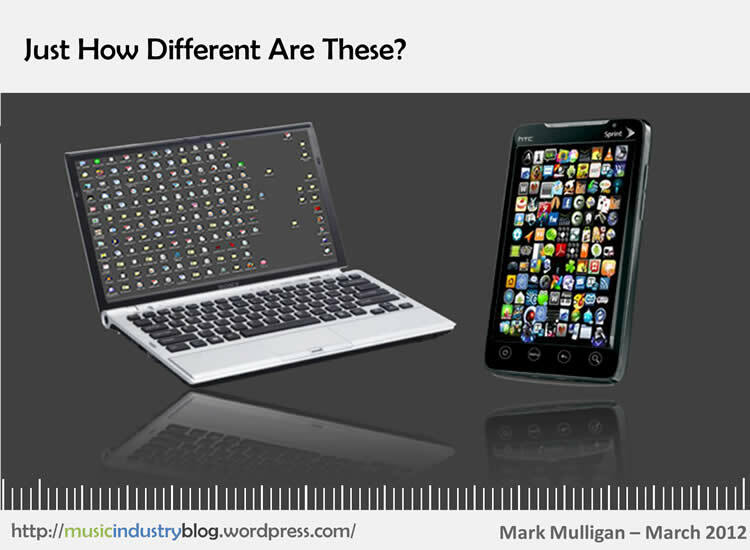 Apps may have driven a paradigm shift in mobile behaviour but they are in the end just software. They are a natural part of the evolution of the mobile platform and experience. They play just the same role as software does for the PC. But of course we don’t excited about having McAfee and Excel icons on our desktop (see figure 2). The reason why it feels so different for Apps is because of the channel strategy, namely App stores. There’s just one place to go and get every type of software you could want, all of course with the same billing details and some guarantee of quality of experience. A far cry from the PC experience of searching the web for the right software, reading reviews and creating a new user profile on yet another online store, hoping that the retailer is safe and secure. A lot of consumer got burned in that first stage of mobile music stores, finding themselves subjected to poor quality experiences that paled in comparison even to the supremely average contemporary online stores. The main mistake made was to expect too much from the rudimentary technology that was available: handset memory and screens were both too small and connectivity was far too slow and patchy. WAP 1.0 and GPRS simply weren’t music delivery technologies. The first stage of mobile music development failed because mobile tried to be a ‘mini-me’ PC music and was doomed to never stand up to the test. The wave of the current App boom has lots of force left in it yet. But when it finally does subside, the marketplace is going to be left realizing that Apps are the tool not the endgame. The next stage of mobile music will be putting into practice what the app revolution has taught us about what mobile should be, what role it should play and where it should sit. 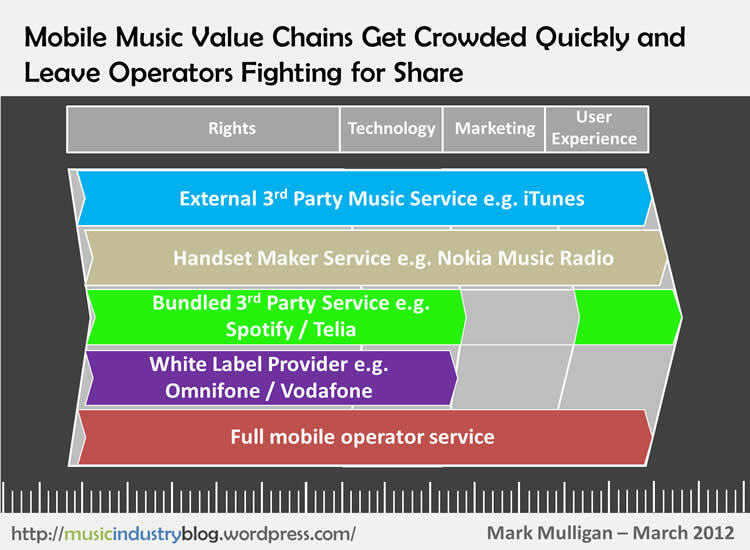 The mobile music service value chain has become a complex place to navigate, with not only competition but also a diversity of business models each with their own unique twist on carving up the revenue pie (see figure five). But value chain conflict doesn’t just impact business, it hits consumers as well, with an increasingly confusing mish mash of music brands on any given phone. And then of course there is the added complexity of ecosystems and operating systems. Consumers are inadvertently being forced into make bets on their long term mobile future. Once a consumer has opted into an app store ecosystem, paid to download apps over a 2 year contract, uploaded their music to a locker, saved their playlists etc it becomes very hard to move. Not so much velvet handcuffs as clapped in iron chains. Add to that the complexity of handset operators developing their own app and music service ecosystems within each of the OS siloes (see figure 6) and an increasingly complex picture emerges. All of which skews the field to music services which are not tied to any single operating system fiefdom. 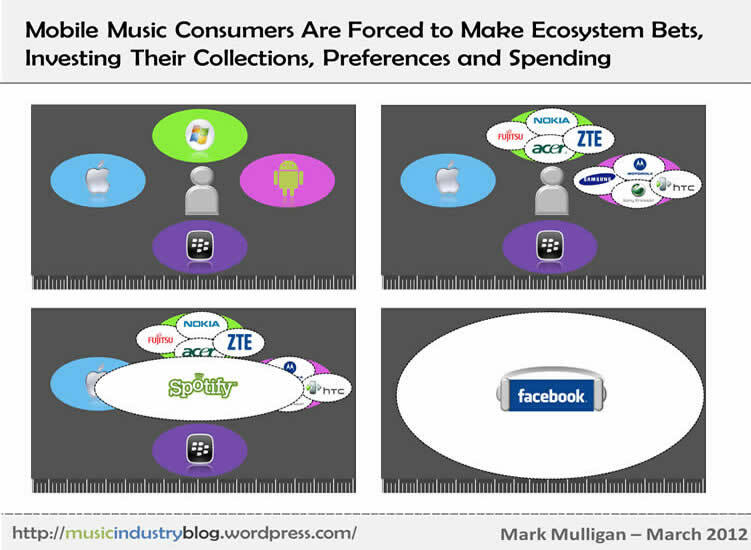 Perhaps the biggest winner out of all of this mobile music fragmentation will be Facebook? Currently quietly collecting the world’s most comprehensive set of music service user data, come the end of the year Facebook will be uniquely well positioned to act as cross-service, cross-OS conduit. Spotify might be making a play for being the operating system for music (I say the API for music, though that’s probably semantics) but Facebook could become operating system for music *services*. There is no doubt that mobile brings a huge amount to the digital music equation, making music discovery, acquisition and consumption more immediate and fun than it has ever been. With the help of the likes of TopSpin and Mobile Roadie it has become the ideal conduit for deepening direct to fan relationships. And though mobile will play a key part in cloud focused music services it is the app developer community which has transformed mobile most. While paid mobile music services remain mired in internecine value chain conflict, Apps have transformed mobile as a music channel from an awkward, underperforming curiosity into something vibrant and truly differentiated. Tablets add important context. They turn the conversation from mobile music strategy to connected device music strategy. (They also do a better job at most music experiences than phones). In fact talking about mobile as a separate channel is no longer that instructive, rather we should think about mobile as one consumer touch point in an integrated channel and platform strategy. But, once again, it is crucial to consider that Apps are the enabler, not the objective. Remember, ringtones were the future once too. The challenge for developers is to navigate through the wild west gold rush, and establish long term learnings from the App boom experience. Think of the App economy as one big market research project (that’s certainly how Apple views it). When the wave subsides the mobile music landscape will have changed forever. Artists, labels, managers, developers, carriers, handset makers all need to work together to ensure that that future is as positive a force for the music industry as the early signs suggest it could be. The depressing alternative is that we look back in 5 years at the App era as another ringtone bubble.